OmmWriter is a writing application for Windows, Mac, and the iPad. It is based on the philosophy that in order to concentrate and be creative, we need a calm and largely distraction free writing environment. 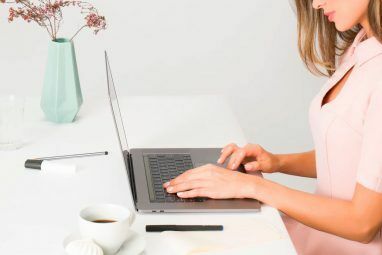 Unfortunately, our electronic writing environments are typically riddled with distractions, be it complex program menus or random messages and alerts popping up. The result is a constant struggle for focus. OmmWriter creates a serene, relaxing, simplistic, and fullscreen writing environment to help you be alone with your thoughts and be inspired. Best enjoyed with headphones! We have previously reviewed OmmWriter for Mac Get Over Writer's Block With OmmWriter, A Zen Distraction-Free Writing App [Mac] Get Over Writer's Block With OmmWriter, A Zen Distraction-Free Writing App [Mac] Read More . It has since been updated with additional features and versions for Windows and the iPad have been released. This review focuses on the Dana I version of Omm Writer, as seen in Windows 7. A donation-based upgrade to Dana II is available, which comes with additional audio and visual effects. 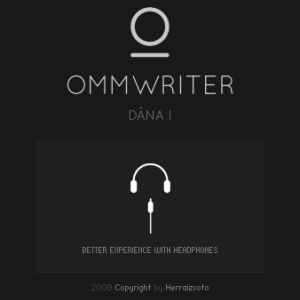 OmmWriter takes over your entire screen and fills it with a serene background image and matching ambient music. A text box area accompanied by a simple menu is your writing space. As you start writing, you will hear typing sounds, adding to the serene atmosphere. After a while, the bar on the right-hand side and the text box with the menu will disappear, leaving you with only a canvas for your words. This is perfect bliss for creative writing. When you move the mouse, the surrounding structure comes back on. You can minimize or close OmmWriter by clicking the respective item in the top right of the bar on the right-hand side. Minimizing the application immediately fades out the music and you’re mercilessly returned to the bleak reality of your desktop. The whole point of OmmWriter is that it has almost no features. Nevertheless, there are some options that are nice to have and good to know about. So let’s have a look at what they are. The menu has six different items: font, font size, background image, music, typing sound, and saving your document. Each comes with very few options. 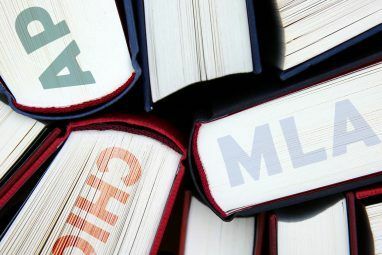 More precisely, you can choose between four different fonts, four different font sizes, three different background images, three different music loops (or off), three different typing sounds (or off), and you can save, save as or open files as .omm or .txt documents. In addition, there is a word count in the bottom center of the text field. Of course you can resize the text field to almost any size you like, as demonstrated below. Once your text exceeds the available space, the bar on the right-hand side will offer a scroll wheel. And after all, some additional features are hidden in a traditional Windows menu that is uncovered at the very top when you hover in that area. The menu structure is dissected below. It contains some additional options, such as exporting your document to PDF, opening a new document, finding text, or transforming text. Personally, I miss the option to personalize the background and the music. Also, for the darker background image, it would be nice to choose a lighter font color. It would also be nice to do some more formatting options to make the PDF export option worthwhile. To me that includes changing the font size only for highlighted text or making highlighted text bold, underlined, or italic. Without being able to format text, I don’t see much sense in exporting the document to PDF. That said, any additional feature would take away from the simplistic experience it offers, so maybe it’s just perfect the way it is. OmmWriter is a great application to find serenity and peace for creative writing. It offers a very calm and relaxing, yet inspiring atmosphere. Features are stripped down to the minimum, preventing the writer to play around with options instead of focusing on the text. I would highly recommend OmmWriter to anyone who is easily distracted and needs a clean desktop environment to write well. What is your preferred writing environment and how do you get rid of distractions? Thanks for sharing your experience with OmmWriter. We're happy that you've found it useful. Thanks for the input, Krzysiek. That review has been a while. Has the program changed much since then? Hey, Write Monkey is my editor of choice, too! I just love that app to bits. :) Even donated. Thank you for posting this. I have tried similar programs such as "FocusWriter" and "WriteMonkey," but am always open to something that will facilitate my writing. I just finished downloading "OmmWriter," so let's see if it replaces "FocusWriter" as my app of choice! Thanks again. Well, do let us know how you like it, Rob!